The debut collection from Ari & M - the fashionably charming duo behind Honey I Dressed the Pug - is nothing short of dazzling. 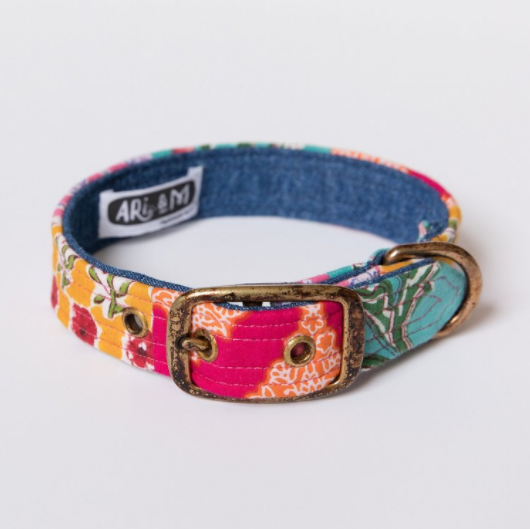 Fun, fashionable and impeccably well-crafted, you're sure to find something in this collection that you and your pup can't live without! There is SO MUCH to love about these collars, starting with the textiles - is there anything more luxurious than brocade? They also look impeccably crafted, with an extra row of stitching for added durability. The aged patina on the brass hardware gives them a casual, vintage feel and honestly, they just look really, super comfy! And you know they have matching leashes to boot! ::THROWS ALL CURRENT LEASHES IN THE TRASH:: Oh and don't forget the most essential part: THE LEASH CLUTCH - big enough to fit all of your walk essentials, including your phone, which you'll definitely want to have so you can snap pics of your newly styling pooch! There are also some smaller ticket items - though it should be noted that the entire collection is shockingly affordable - collars start at just £30 and leashes at £40, with bandanas available at just £20. And even if you can't spring for a whole set - you can still snag the signature Ari & M style with one of these adorable pom pom charms! Utter perfection. Shop the entire Ari & M collection here! Biggest congrats to Ari & Maitri on this new venture!